This painting is #32 of the Bermuda Collection. The house, or English, sparrow is well-known almost everywhere because it's been introduced worldwide. In cities, it's a sooty bird, but in the country it's markings are clear like this one. 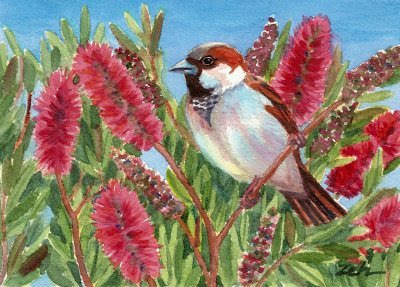 This sparrow was always near the cottage where my sister and I stayed in Bermuda. He was either nearby on the edge of the roof or on a shutter to greet us as we came and went. He even let me take some close-up pictures of him. These sparrows were introduced to Bermuda and soon multiplied to the extent that stringent efforts now need to be made to protect their bluebird population as the sparrow competes. Now, the bottlebrush tree, also known as Callistemon...I'd never seen one before I went to Bermuda. It's a tropical tree and this one was in full bloom at the Bermuda Botanical Gardens. What a beautiful tree! Blooming in springtime, it is covered with colorful bottlebrush-shaped flowers. This is one of those paintings that just worked from the get-go. I love when that happens. The bird seemed to fly on his own into the tree and perch on one of the branches. When you see the original, I think you'll agree!